India is the birthplace of Buddhism. A religion which was founded on the belief of peace, nonviolence and spiritual awakening, which it propagated far and beyond the borders of India. In a host of countries it is the primary religion; whereas in India the scene is different. In India Buddhism is restricted to pockets which are primarily set high in the Himalayas. The Himalayas is the place, where the Buddhist monks have been seeking solitude for many centuries to meditate and pray and in an effort to attain spiritual enlightenment which led to the construction of the beautiful monasteries in the mountains. The monasteries are homes of the Buddhist monks and for a long time these monasteries remained isolated from the outside world and now have opened up the multi hued temples to the outer world. The mountains which surround these monasteries reverberate with the chants of "Om Mani Padme Hum" which constantly emanate from the confines of these monasteries. If you are looking for a soul searching experience, then head to the monasteries in the north eastern parts of India. Read on to know more. Tawang Monastery is located in Arunachal Pradesh; it is the largest monastery in India and the second largest in the world after the Potala Palace in Lhasa, Tibet. The monastery is situated in the valley of the Tawang river which lies at a very close proximity to the Tibetan and Bhutanese borders of India. The Tawang Monastery is known as Galden Namgey Lhatse in Tibetan, which means celestial paradise in a clear night. It was founded bu Merak Lama Lodre Gyatso in 1680-1681 as per the wishes of the 5th Dalai Lama, Ngawang Lobsang Gyatso. Pemayangtse Monastery is located in the town of Pelling. 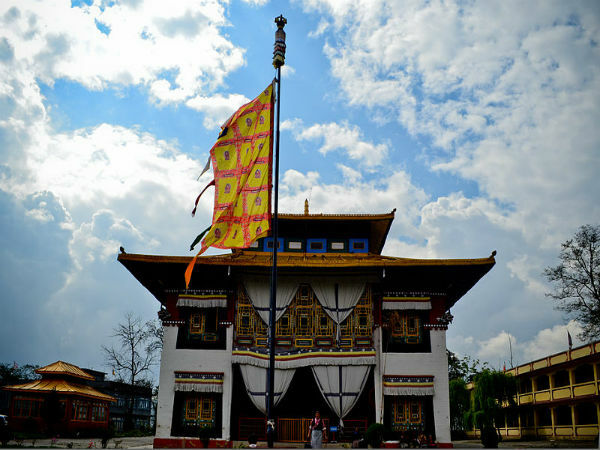 The monastery was planned, designed and founded by Lama Lhatsun Chempo in the year 1705 and is one of the oldest and premier monasteries of Sikkim and is also one of the most famous ones in West Sikkim. The monastery controls all the other monasteries of the Nyingma Order of Tibetan Buddhism in Sikkim. The Bomdila monastery is one of the most prominent centres for the Lamaistic faith of Mahayana Buddhism. The monastery is a replica of the Tsona Gontse monastery at Tsona in southern Tibet. The Bomdila monastery is also known as the Gentse Gaden Rabgyel Ling monastery and was built by the 12th reincarnation of Tsona Gontse Rinpoche in the year 1965. The monastery was later on renovated and enlarged by the 13th reincarnation of Tsona Gontse Rinpoche and was blessed by His Holiness the 14th Dalai Lama in 1997. The Tashiding monastery is one of the important monasteries which belongs to the Nyingmapa order and is located about 40 km away from Pelling. The monastery is located atop a hill which is spread across the rivers of Rathong and Rangit. Tashiding means the devoted central glory; the monastery was founded in the year 1641 by Ngadak Sempa Chempa Phunshok Rigzing. Lingdum Monastery, also known as Ranka Monastery is located about 20 km from Gangtok town and is one of the most beautiful monasteries in east Sikkim. The monastery is spread across a vast area which offers great scenic views. The monastery is relatively a new monastery and is not much spoken about. Surrounded by lush hills the monastery emits a divine atmosphere and is also one of the most decorated monasteries. The Phodong Monastery was built in the early 18th century and is located 28 km away from Gangtok. There was an older monastery which existed before the current one was built. The 9th Karmapa was invited by the king of Sikkim and he founded three monasteries; Rumtek, Phodong and Ralang out of which the Rumtek is one of the most important. The Enchey Monastery is situated in Gangtok atop a hill; it was built during the reign of Thutob Namgyal in 1909. Enchey translates to solitary; as per legends, Guru Padmasambhava is said to have subdued the spirits of Khangchendzonga, Yabdean and Mahakala here. It is believed that these deities would fulfill all the wishes made by a devotee. Rumtek Monastery is also known as the Dharmachakra Centre and is located near Gangtok. The monastery is the largest in Sikkim; the monstery was built under the supervision of Changchub Dorje who was the 12th Karmapa Lama in the mid 1700. When Rangajung Rigpe Dorje, the 16th Karmapa arrived in Sikkim in the year 1959 after fleeing Tibet, the monastery was in ruins then and the Karmapa decided to rebuild Rumtek and made it his main seat in exile. Lava Monastery, also known as Kagyu Thekchen Ling Monastery is located in the small hamlet of Lava. In the year 1987, the Buddhist community which belonged here offered 3 acres of land to the 3rd Jamgon Kongtrul Rinpoche for the construction of a monastery for the local community. The monastery offers a clear view of the beautiful forests which surround the town and a gorgeous view of the majestic Kanchenjunga which provides an excellent ambiance of peace which is added on further by the chirping of birds. Durpin Dara Monastery is Kalimpong's largest monastery and is also known as Zangtok Pelru Phodang which sits atop the panoramic Durpin Hill. The monastery houses some of the rare Buddhist manuscripts on Tibetology called The Kangyur which comprises of 108 volumes. These manuscripts were gifted by the Dalai Lama during his visit to Kalimpong in the year 1956 and the monastery was opened by Dalai Lama in the year 1976.